They date back to the time of Thomas Edison. They’ve provided decades and decades of warm bright light to our homes and workplaces. And they’re about go bye-bye. On Jan. 1, 2018, the humble everyday incandescent light bulb will reach a milestone in its long and steady fade into our collective memory. Under environmental regulations that take effect that day, the bulbs burn too much energy to be sold in California; stores will be able to exhaust current supplies, but they will eventually run out. For consumers, that means choosing among more efficient bulbs that use no more than 72 watts, including halogen incandescents, compact fluorescents and light-emitting diode, or LED, bulbs. In other words, it’s deja vu all over again. As part of the 2007 national energy bill passed by Congress with bipartisan support and signed into law by President George W. Bush, energy efficiency standards were established for new light bulbs that ensured a smooth and gradual national transition to energy-saving bulbs. California’s regulations make the transition happen a little faster. Why are the old incandescent bulbs going away? 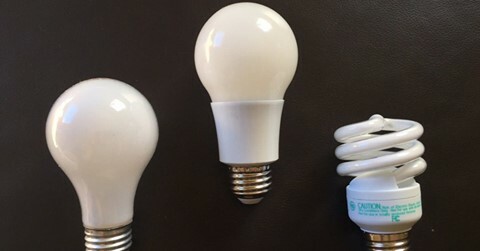 Those common, screw-based light bulbs must meet a minimum energy efficiency level that’s three times more efficient than the old incandescent bulbs as of Jan. 1 in California (and nationally as of 2020). No incandescent or halogen bulb on the market comes close to meeting that level. California consumers will be choosing between energy-saving CFL and LED light bulbs in California stores as of Jan. 1. Will the bulbs vanish from shelves overnight? No. Retailers will be allowed to sell what they’ve got left, but then they must stock those shelves with the bulbs that meet the state’s new and tougher environmental standards. The people making and selling light bulbs have known about this coming change for more than ten years now and they’ve responded to the challenge by offering a complete suite of new energy-saving light bulbs that meet the new standards. They’re also winding down their manufacture of incandescents. Is this a good thing for California consumers? The standards apply to most medium screw-based bulbs used in our homes and businesses, including the ubiquitous pear-shaped bulbs used in table and floor lamps, the globe or round bulbs of more than 40 watts used in bathroom vanities, and the candle-shaped lamps of more than 40 watts used in chandeliers and sconces. Will it be easy to find replacements? A wide assortment of energy-saving LED bulbs in every shape and light output level already can be found on the shelves of leading retailers across the state. These bulbs are from well-known lighting companies such as Philips, GE, and Sylvania as well as newer companies that specialize in efficient lighting such as Cree, TCP, Feit, and Maxlite. California’s light bulb regulations currently exempt some types of bulbs, such as those used in ovens. Finally, the first LED bulbs were a turn-off to many consumers because of their harsh bright light. What now?